First, let’s get something straight: a fidget spinner is a simple, small handheld “wheel” that can be spun. That’s it. All spinners do is spin, but that’s why they’re so alluring! They spin, yet they perform at a different level as well — custom fidget toys can provide comfort in stressful situations. Although fidget spinners are popular new toys, being a toy is not what makes them especially interesting. The marketable part of this toy is that the spinner helps the user focus better by not fidgeting. These gadgets were designed to provide a sense of comfort by calming the nerves, and easing stress while potentially helping with symptoms due to ADD, ADHD and autism. They can also be used for individuals who bite their nails, daydream, or otherwise need help staying focused. More simply speaking, they’re plain fun. To stay focused, alleviate anxiety, or avoid boredom, you simply hold the middle of the tri-fidget hand spinner between your thumb and index or middle finger. Then, spin the arms/prongs and let it twirl! These custom stress relievers will fit comfortably in your hand, and they easily spin with a quick flick of the finger. The fidget spinner design is a simple construction. They are small devices with three prongs that surround a bearing in the middle that allows the product to spin in your hand. Typically, they are made from metal or plastic and come in a variety of designs and colors. No one knows exactly why fidget spinners are so popular — not even the product’s inventor. However, we recommend them as a fantastic giveaway for customers or prospects at a tradeshow or conference or just for fun! These will also make a great promotion for all grade school classrooms, healthcare agencies, clinics, waiting rooms, and any other business geared towards kids or families. After all, who doesn’t need an outlet for their nervous energy or a bit of focus when boredom sets in? These are great for customers, employees, clients, friends and family, adults and children for the genuine mental health benefits. For the office, this product is nearly silent — so individuals can fidget away without disrupting their co-workers! These handy stress relievers can help distract cubicle neighbors that might otherwise be clicking their pen or tapping their feet. They can even help to keep people alert and awake during meetings that seem to drag on. A few months ago, several staffers at Forbes tested out some fidget spinners at home and the office, and most were pleased. One of the positive outcomes they noticed was that they got up from their desks less, instead putting their energy into fidgeting with the spinner — rather than taking mindless trips to the break room or vending machine. And here’s a value that you probably never considered. When people are playing with a fidget, they’re not staring at a screen. For a short time, they step away from their phone, iPad and video game. Now let us tell you about some other benefits of the fidget. They are made of durable ABS plastic with aluminum alloy bearing. They are very simple to maintain. There are no sharp edges so fingers, so there’s no worries about employees or potential customers getting injured when it’s spinning at high speeds. It’s lightweight, spins on many hard surfaces and can rotate for about two minutes. Their compact, portable size means that they can easily fit into your pocket, tradeshow tote bag or purse. 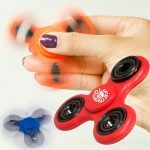 Choose the spinner you want from our full selection of Promotional Fidget Spinners. We carry these toys in a number of colors, and offer various customization options. This means you’ll be sure to find the perfect toy that fits your brand aesthetic. Pick a classic Solid Fidget Spinner in an amazing selection of colors, or choose a Mix-n-Match Fidget Spinner that allows you to choose colorful combinations of spinner and button colors. The total size of the fidget is 3”x3” with the imprint area being ¾” in diameter. You can choose to pad print or screen print fidgets in a single color or in full, brilliant color. Think about how much exposure your brand will get when it’s carried about in public, and at the fidget tips of your potential clients! The fidget hand spinner will be appreciated by anyone who has ever felt stressed, anxious or needed a way to release that energy without being disruptive – so jump on the trend and add fidget spinners to your marketing efforts.